The Battle of Hunding Bay, also known as the Battle of Stros M'Kai, fought in 2E 864 at Stros M'Kai in the Bay of Hunding, was the brutal conclusion of the civil war between the Crowns and the Forebears, marking the fall of the last human kingdom to Tiber Septim's new Empire. The cause of the civil war between Hammerfell's two most prominent factions lies in their traditional antagonism reaching back to the invasion of Tamriel by Yokudans. Over time the descendants of the Ra Gada claimed forbearance to the warriors and sailors of the original invasion fleet and demanded rights. Opposed to them stood the descendants of Yokudan nobility, the Na-Totambu, and those loyal to them, gathering around them all more traditionally and nationalistically minded people. This state of affairs officially formalized during the Second Empire, when political parties formed out of these groups, with the former calling themselves the Forebears and the latter group calling themselves the Crowns. Under the rule of the Reman Dynasty, the kingdom was displaced by a republic, with the much-admired warriors comprising of the Forebears finally being granted rights of ownership, while the Crowns retained the rights of noble council. After the death of the last Akaviri Potentate Savirien-Chorak in 2E 430, and the subsequent fall of the Second Empire, the rule in Hammerfell quickly reverted to a monarchy under the rule of Crown-allegiant High Kings. The situation persisted in this vein for the most of the Second Era, until the formation of the Third Empire with the coming of Tiber Septim. Even before the Imperials again became a threat to the Redguards of Hammerfell, the rivalry between the Crowns and the Forebears had slowly started to reach its boiling point. It was during Thassad II's late reign that Forebear forces started training underground for the day that the relatively neutral king will be replaced by his Crown-allegiant son Crown Prince A'tor and for the revolution that will ensue afterwards. However, a solemn screenplay by a usually satirical Crown writer, father of Cyrus and Iszara, depicting the invasion of Tamriel with the Ra Gada fighting loyally for the Na-Totambu, made both sides temporarily put aside their difference in face of the threat that the Empire posed. Opposed with a unified Hammerfell, Septim could only bide his time. After the unusually peaceful passing of the High King Thassad in 2E 862, the civil war was finally sparked when Baron Volag, leader of the Forebears, led an uprising and took the capital of Sentinel by force, purging it from all Crowns. For two bloody years, the war continued in all its brutality. After the Crown Prince A'tor regrouped his forces at his temporary seat of power at Stros M'Kai, the fortune of war turned in the favor of the Crowns, with a retaking of the capital being planned. Faced with the prospect of losing the war, the Forebears, who have had a long history of cooperation with the Imperials, even accepting their culture and customs to a degree, decided to ask Septim for aid. This act was regarded as treason to the kingdom by the Crowns, who denounced the Forebears as "throne-defilers", "hosts to the invader" and "Hunding's shame". The already weakened Crowns were no match for the Empire, but still managed to inflict heavy losses on the Imperials. Ultimately, they decided to make a stand at the isle of Stros M'Kai. 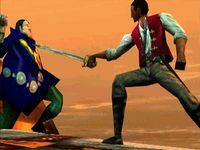 The Crowns were led by A'tor, whose lead supporters were Voa, the Arch-Mage of Stros M'Kai and the Prince's chief advisor, and Iszara, his consort and liaison with the Restless League, a Redguard nationalist pirate syndicate based in the Iliac. The Imperials were led by Tiber Septim's finest naval commander Admiral Amiel Richton, with the Imperial Emissary Dram acting as his advisor and battlefield assassin and the dragon Nafaalilargus, Richton's secret weapon. The Forebears were not present at the battle, and neither was the Restless League, who waited just out of sight, out of concern that they might hurt A'tor's reputation. 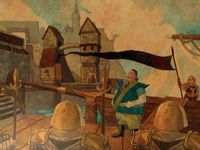 While both commanders were experts at naval battles, the outcome slowly started shifting in favor of the Crowns, until Richton reluctantly called in Nafaalilargus. Seeing the dragon for the threat that he was, considering he could burn down the entire fleet, A'tor commanded his ranged troops to dispose of him. It was in that exact moment that Dram, allegedly using the Bow of Shadows, fired a poisonous arrow and mortally wounded the Prince. Voa tried to save him, but with the poison being too strong and the dragon closing in, he could only place the Prince's soul in a gem and his body under a stasis field, before being killed by the dragon. While there were no survivors from the flagship, somehow both Voa's and A'tor's bodies were recovered. 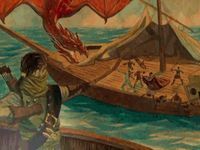 Using the confusion caused by the death of the Crown commander, the dragon attacked the fleet relentlessly, making them hastily retreat towards the harbor of Stros M'Kai in the Hunding Bay. Most of the troops disembarked at the Old Quarter, while a smaller group consisting of wounded soldiers made their way to the local chapter of the Temple of Arkay hoping the priests there would heal the wounded and give last rites to the dying. It was also in this temple that the body of Prince A'tor was hidden. The Imperials followed the larger group, and instead of fighting them and attempting to rout them, Richton simply ordered Nafaalilargus to burn down the entire section of the city with all the Crowns inside, leaving no survivors. According to the Forebears, the remaining Crown fanatics burned the Old Quarter to the ground along with themselves rather than surrender. Imperials took the city with no resistance and demanded from the priests of Arkay to turn over the remaining Crown forces. Eventually, Richton allowed the wounded to be treated only to execute them all after they were healed. In honor of the victory the First Edition of the Pocket Guide to the Empire was published. While it celebrated the Imperials as liberators of Redguards from the "mad Prince", the reality was much different. Lord Richton was appointed Provisional Governor of Stros M'Kai, and he took the liberty of disposing of all Crowns and Crown sympathizers, labeling them as rebels and thus traitors to the Empire. Disgruntled with the Mages Guild, whose former leader assisted the Crowns, he allowed a local necromancer, the notorious Sload N'Gasta to conduct his experiments openly, freely gathering souls of those not interred in hallow grounds. Nafaalilargus was given the entire treasury of the Stros M'Kai's palace to watch over for his commendable service to the Emperor. The Imperial victory marked the end of Hammerfell's independence. Not one day after the Crown's defeat, Baron Volag went into hiding in the hills outside of Sentinel, rumored to be disposed of by the Imperials. Senecus Goddkey was appointed Provisional Governor of Sentinel, residing within the royal palace, former governmental seat of Hammerfell, a circumstance that most Redguards greatly despised. The terms of the Forebear Truce were nullified and rewritten, allowing Imperial garrisons to be stationed in Hammerfell. In effect, the Empire has taken full control, and incorporated Hammerfell as a province of the Empire. In the meantime, the Restless League, led by Capitan Basil, obtained the gem containing the Prince's soul and sought to revive him so that he could lead them into war with the Imperials. Until then, the League had to resort to conducting terrorist attacks across Hammerfell's shore, the most notorious being the burning of Richton's flagship in the harbor of Stros M'Kai. The Imperials only intensified their repression, forcing the League to go into hiding to bide their time. Iszara, not being able to bear the League's inaction for long, stole the gem on the 26th of First Seed, 2E 864 and sought the help of N'Gasta. She asked him to revive her late lover in exchange for her own soul. He, however, betrayed her and had the gem fashioned into the shape of a dragon and had it delivered to Richton – a fitting gift for a faction whose symbol was a dragon and whose commander had bested A'tor commanding such a creature. The gem was given to Nafaalilargus for safekeeping. Three months after the Battle, Cyrus, Iszara's brother, came to Stros M'Kai looking for her after she had disappeared. "How remarkable. I may well be the first Imperial Admiral to surrender at this altitude." Is this how you will honor your Prince then? Cautious I've thought you, Basil, but never before a coward. We all have waited for the Prince's return. Now that he has returned, you walk away. The form is different, true, but his spirit is here, here. And isn't his spirit the truest part of him? Did it occur that maybe he chose this shape and symbol as the sign of his intentions? Aye, perhaps that soul, in hated delay, snared helpless in a jewel while his men hid and shirked their duties, his duty, perhaps that soul honed itself to this and by no mistake comes to you now in no more fine and final form as this: a sword. You say you cannot follow a sword? Well, I say that you have strayed from your own too long! Why are you here but to fight? Your Prince has shown you the manner of his purest mettle, aye in metal itself! And this true unerring razor's message is clear beyond words for now's not the time for words, but for brave hands, bright swords, and blood. Aye, boys, it's about blood now too long frozen in your veins and you'd rather yourself be rigid than follow me. Well, if you won't, then shamefully know that your Prince will! For his blood be solid, too, but straightened to steel and tempered in death! Rise alike as he as swords as we are Crowns alike as he! The Prince is dead! Long live the Prince! Familiarizing himself with the issues of the war and the city, Cyrus quickly made contact with the Restless League, reluctantly agreeing to assist them in the rebellion to come in exchange for information regarding his sister. Cyrus killed N'Gasta, saving Iszara, and recovered Voa's Ring, which was used to put the Prince's body in stasis. Finding out where the Prince's soul was kept, he made his way to the royal palace and slew Nafaalilargus, obtaining the soulgem he was guarding, and the Restless League attempted to resurrect the Prince. The end result, however, was that A'tor's sword was unintentionally enchanted with his soul, given free will of its own. Cyrus managed to rally the League's members, whose moral had been devastated by this turn of events, with a speech, possibly inspired by A'tor. While the league led by Basil and Iszara covertly killed the Imperial guards and burned their ships in the harbor Cyrus stormed the palace which was devoid of guards, all of them having been sent on a raid against the League's base. He cornered Richton atop a Dwemer airship, and after besting him in swordfight, he was ambushed by Dram. However, A'tor's sword took them all by surprise, stabbing Richton and cutting Dram in half, which gave Cyrus the opportunity to escape. Soon after hearing of the Crown's victory in the rebellion, Baron Volag reemerged and took Sentinel by force. 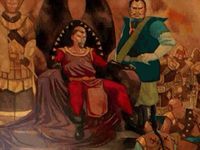 With the entire province in uprising, Tiber Septim was forced to sign a treaty with Iszara and Volag, each representing their own respective faction. The treaty formally established Hammerfell as a province of the Empire, equal to all others. The political situation of Hammerfell quickly reverted to that prior to the two wars, both Crowns and Forebears vying for dominance with no success, but with all the old grudges kept. This page was last modified on 9 November 2018, at 08:53.